Comparing the depth of field of two types of flatbed scanner, a CIS and a CCD model. There are two common types of consumer flatbed scanner梩he so-called CIS (Contact Image Sensor) and the CCD (Charge Coupled Device) designs. The Wikipedia entry for 'Image Scanner' briefly summarises their operation. They both have pros and cons which are briefly commented on below using a model by Canon of each design. Making a suitable choice is particularly important if a modest amount of depth of field is required. Curiously, most makers don't point out their important differences and the specifications can even confuse梐 CIS scanner may have a lid to accept thick books梡erhaps suggesting they are capable of scanning at good depth of field. 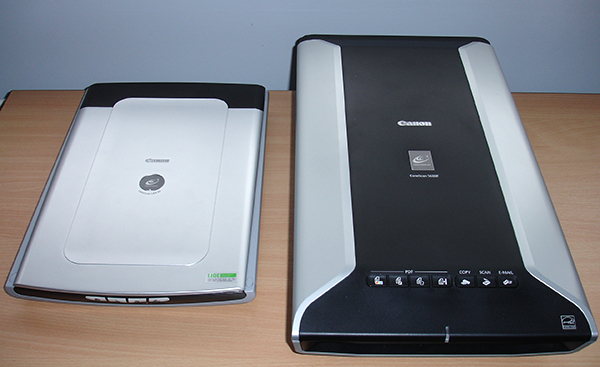 Right: Two typical A4 flatbed scanners (CanoScan), on the left is a CIS scanner, the LiDE 60 and on the right a CCD scanner, the 5600F. If compactness and best price are key criteria, the CIS design has advantages, but this is usually at the penalty of very little depth of field if this is important for scanning e.g. creased paper, text into book spines and 3D objects with some modest depth of field to capture detail. The CCD scanner is bulkier and more expensive, typically ca. � cf � for a comparable LiDE model. 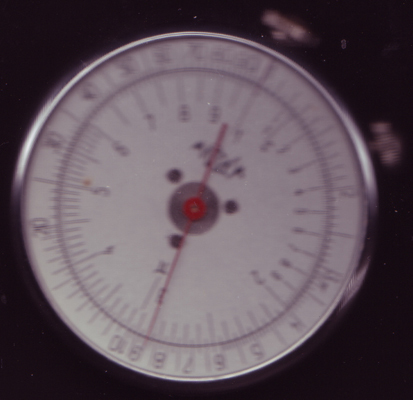 The benefit of a CCD model is some usable depth of field as shown below, often twice the dpi and an accessory for scanning 35 mm film which may have potential for scanning large subject microscope slides (reported on separately). A simple way to quantify depth of field of a scanner is to lay a steel rule on the platen supported off the platen at one end (in this case 14 mm). The scan therefore shows the hypotenuse of a triangle and simple trigonometry gives the depth of field at each rule mark. For every 10 mm on rule presented as sharp梩he vertical depth of field at that rule mark is 0.88 mm. CIS scanner. A CanoScan LiDE 60, 300 dpi scan, resized without sharpening. Two aspects are immediately apparent: subject illumination is very poor unless it is in close contact or a few mm off the platen. The maximum depth of field with some sharpening and still well lit is ca. 10 mm along the rule, i.e. barely 1 mm depth of field. CCD scanner. A CanoScan 5600F, 300 dpi scan, resized without sharpening. The rule is well lit along its full length. The maximum depth of field with near best sharpness is ca. 100 mm along the rule, i.e. a much more usable 9+ mm depth of field. As above, repeat scan using the built-in unsharp mask feature in the scan software. Usable to at least 120 mm and possibly more with suitable subject and resizing for web and sharpening, i.e 10 mm or more depth of field. For these two Canon models, the CCD design has at least 10X the depth of field of the CIS. Although d.o.f is still quite modest it can be sufficient for a range of 3D subjects, e.g. artwork created for the increasingly popular pursuit of scanography. In my own case it is useful for scanning slide rules as they are a challenge to photograph. See 'The Appeal of Slide Rules' article where the 5600F scanner was used. 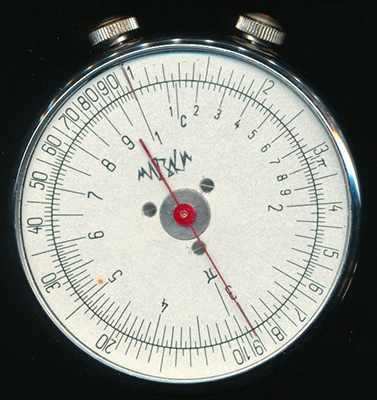 An example of a scan of Russian KL-1 pocket watch slide rule is compared below on both scanners. A pocket watch slide rule with a depth from its plastic face to scale of barely 2 mm. The 5600F scanner (CCD design) is readily capable of illuminating it well and scanning, but the LiDE 60 (LED design) cannot. Note that if scanning 3D objects there can be distortion introduced by some scanners, this is covered on websites discussing 3D scanning. Published in the December 2012 edition of Micscape.